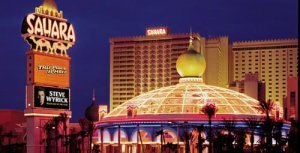 Location Just as the Mandalay Bay is the last casino at the trendy Southern end of the Strip; Sahara is the last on the not so fashionable North end of the Strip. The only neighbors in easy walking distance are Circus Circus, The Stratosphere and the Riviera. At night it feels a little uneasy mainly due to the fact that the pavements, unlike the Southern end of the Strip, are empty and dark. However the coming of the Monorail and its station is the only one that is not miles from the actual casino has greatly increased the location of this Strip legend. Theme Moorish Moroccan flavour is the order of the day here. There used to be a massive pillar with a camel on it but that has gone; pity because I liked it. My pillar has been replaced with a huge dome that lights up at night, it does look sort of Moorish but don't ask me why as I cannot see any herdsman's tent having this many lights. The theme is carried with good taste throughout the casino but quite subtly, so that if asked what the theme was you would know but could not say why. Pool The pool is better than you would expect it’s not big but it’s quite nice apart from the view of the parking lot! You can rent Cabanas here for $25 per day when you think at Mandalay and the alike you can spend $500 it’s a bargain. Shows and Entertainment Sahara says that you will find here the most sought after entertainment I don’t think that is quite true !Fab Four Mania is the main headliner here you can guess what the show is, its quite ironic that the Beatles have preformed here. The Platters, Cornell Gunter's Coasters & The Marvelettes perform nightly and Brett Daniels a magician started here in April 2008. Dining The Sahara Buffet (B: $8.99, L: $9.99, D: $10.99 Champagne Sunday Brunch $13.99) is one of the cheapest on the Strip particularly if you get the $1 off coupon in most of the free magazines. I thought this was good value, the food was nice and there was a great choice but the dining area is a little too crowded. Paco’s hideaway is meant to be Mexican but is not really spicy enough; it does however represent excellent value. The Caravan Room is a below standard 24hr coffee shop, there is also a Gourmet Steak House and the NASCAR café for racing enthusiasts and children alike. Gaming 95,000 sq ft which is about right in my reckoning, it is simple to navigate and fun. There are about 40 tables with minimums starting at $1 the lowest on the Strip. There are about 1500 slot machines with a very good selection of nickel machines and there seem to be loads with prizes of a car or a motorbike for a three nickel investment. I first came here in 1992 and the place was, frankly, a hole! It has since had a lot of money spent on it and is far nicer for it. With such low minimums the Sahara does tend to attract a more down market type of clientele, particularly at weekends, and it can feel a little unpleasant. As a result the staff sometimes act in a more aggressive manner than is usually seen in Vegas. Whilst I enjoy playing in the Sahara I avoid it Friday and Saturday evenings. Good points Value It is great value and good fun, they know the market that they attract and are not trying to aspire to anything else. Bad points The location is very poor and at weekends the clientele are not so nice. Top Tip Get the all day passes for the Cyber Speedway and Speed the ride this really is exceptional value.